So Young (Anna) Lee graduated from the University of California-Los Angeles and received a B.A. in Political Science. Before entering law school, Anna worked at Child & Marton, LLP, a civil litigation law firm in Los Angeles. 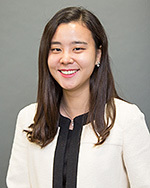 As a 1L, Anna participated as a member of Asian Pacific American Law Students Association (APALSA) and the Immigration Law Society. As a 2L, she now serves as the Vice President for the Immigration Law Society and the webmaster for the APALSA. Anna is also a member of the Moot Court Honors Society. After her first year of law school, she started working as a law clerk in a commercial law firm in Chicago. In her free time she enjoys riding her bicycle and searching for the best coffee in Chicago.